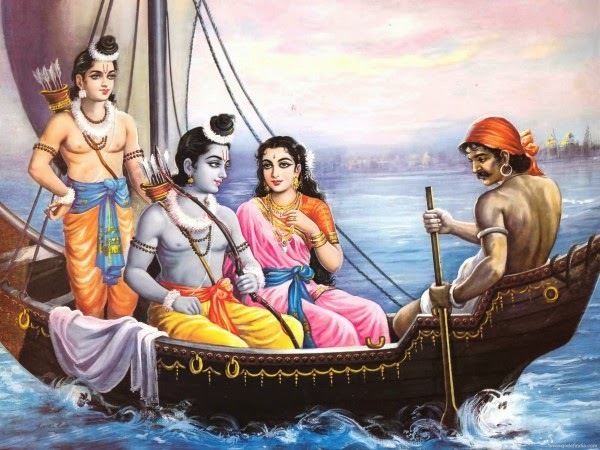 Ramayana story: Lord Rama and boatmen Kevat! When Lord Sri Ramachandra reached the forest with Sita and Lakshmana they had to cross river Ganga. Guha had heard about the banishment of Lord Rama and came running to help Him. One of his boatmen was unloading people on the opposite bank and Guha said to Kevat to bring the boat and take divine personalities on other side of mother Ganga. Kevat brought the boat near Lord Rama, got down and did namaskaar with intense devotion to Lord Rama. He started and ended his days with prayers to Lord Rama and throughout the day he was well known for talking about the glories of Lord. Kevat asked Guha whether he could wash Lord’s feet before He stepped into the boat. Guha told him to wash His feet after seating Him in the boat. But Kevat was adamant and told Guha that he would like to wash Lord’s feet before he got into the boat. Guha was a little angry at his stubbornness and was about to loose temper. Lord Rama smiled looking at Sita devi and remained silent. Lord Rama appreciated his pure and innocent faith. After washing their feet Kevat place his hands on earth and ask Lord to first step on his hand before stepping into the boat. This way he washed all his sins by having a touch of Lords feet. After washing the Lord’s feet, Kevat ferried them across the river. As soon as they alighted from the boat, Ma Sita immediately withdrew a ring from her finger and handed it over to Lord Rama, signaling to him to pass it on to the boatman. Lord Rama: Here Brother, that is all we can pay you for your kind service. Please accept it! Kevat: (Shaking his head). No, My Lord! I can not possibly accept this from you. Kevat: Because people of the same profession do not charge each other for their services. A barber never takes payment, when he gives a haircut to another barber. Even a washer-man never charges a fellow washer-man. Lord Rama: Brother, how can you and I be of the same profession? You are a boatman and I am…. Kevat: Lord, both of us do the same work. I ferry people from this shore of the Ganges to the other. You ferry people across the ocean of Samsaara (Bhav-sagar),through the journey of life. How can I accept payment from you? Prabhu! I don’t want anything. But please, as I have made you cross this river today, when my time comes, take me across sansaar saagar [the ocean of material existence!]. That would be your return to me. The Lord was so overwhelmed at this devotional request from Kevat, that he held out his arms and embraced the boatman. Later, the expert ferryman was delivered from the cycle of birth and death just because of this little service done unto the Supreme Lord! He also asked Lord for endless devotion to lotus feet of Lord Rama. Lord Rama said that from today you not need to take another birth, and granted Kevat – Mukti from material world. We all ask God for material elements and temporary material pleasure. This is just like asking a rupee to a benevolent who has ability to give you whole world. How foolish are we, who runs after the world leaving the loving supreme soul. Let’s act smartly like this expert ferryman. Let’s do some devotional service unto Supreme Lord Hari. That way reaching the ultimate perfection in life would be assured. The Merciful Lord comes Himself or sends His devotees (saints) to show us the right direction. As soon as Arjuna accepted Lord Krishna as his guide, Lord’s perfect instructions lead him to victory and fame. Little service rendered to the merciful Supreme Lord would please Him and He would hold the reins of the chariot of our life. And, when the Supreme Lord would be our guide, would there be any doubt in our victory on the path of life? PS: I humbly request all the devotees to please forward and share this moral / instructive stories they hear so that everyone can be benefitted by hearing about Krishna and his dear devotees.